Food blogs are an easy way to get to know food from all over the world, without having to leave your home. 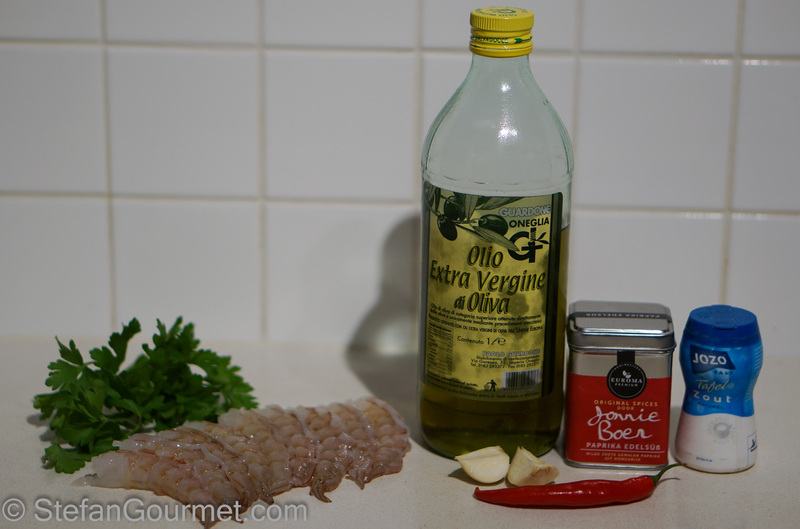 I have been to the Spanish Costa del Sol a long time ago, but got to know Gambas al Pil Pil through an Irish food blog. Or should I say ‘the’ Irish food blog? The large shrimp that are called gambas in Spain are so well loved in the Netherlands, that we call this size of shrimp “gamba’s”. Tapas bars on the Costa del Sol prepare them with olive oil, garlic, paprika (pimentón), hot chili pepper, and parsley, and call that dish Gambas al Pil Pil. They are usually served sizzling hot straight from the oven. 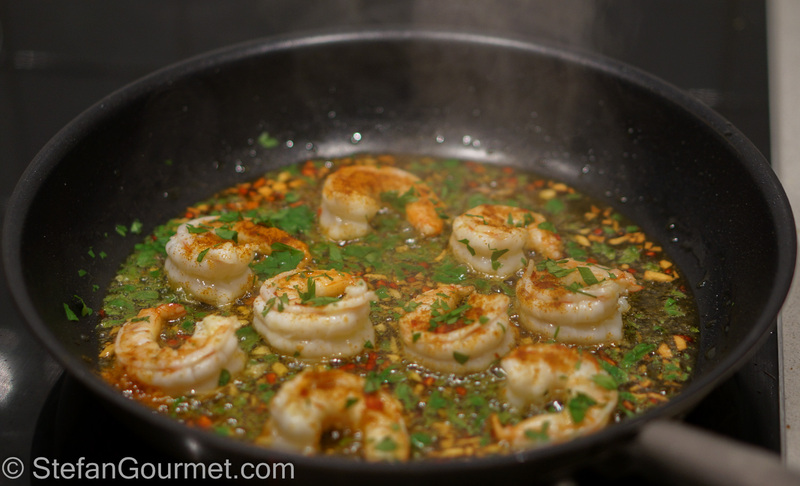 Since shrimp are easily overcooked, I opted to prepare this dish in a non-stick frying pan instead. These shrimp are delicious. The combination of flavors works very well and actually becomes a whole new deep flavor that is best savored by dipping crusty bread in the flavorful olive oil. Thanks for the inspiration, Conor. For best results, use wild caught shrimp. Fresh is best, but frozen is a good substitute as fresh shrimp are difficult to come by in most parts of the world. 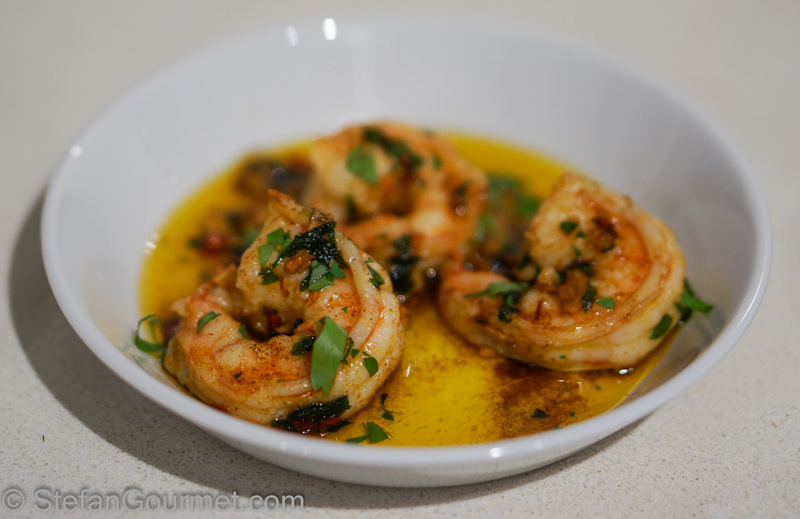 Wild caught shrimp have much more flavor than their farmed counterparts. They are more expensive, but I can assure you that you will be able to tell the difference. 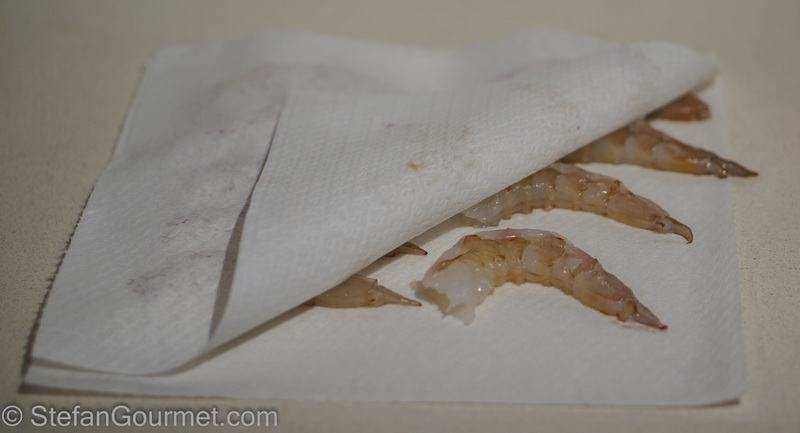 Pat the shrimp dry with paper towels. 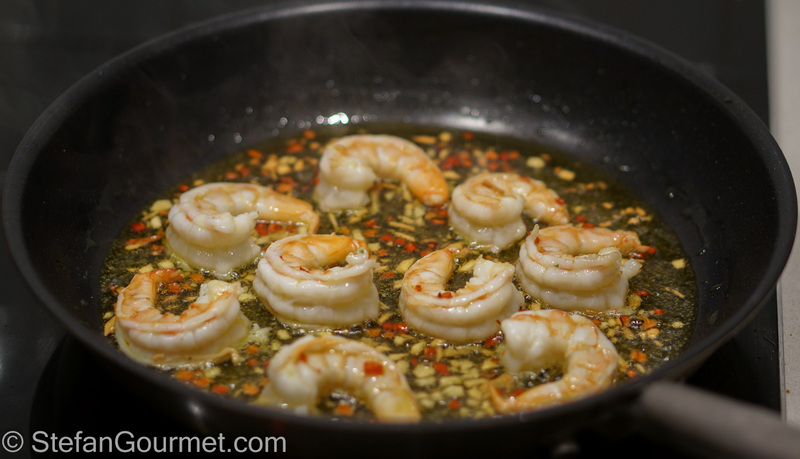 Heat a generous amount of extra virgin olive oil in a non-stick frying pan over medium high heat. 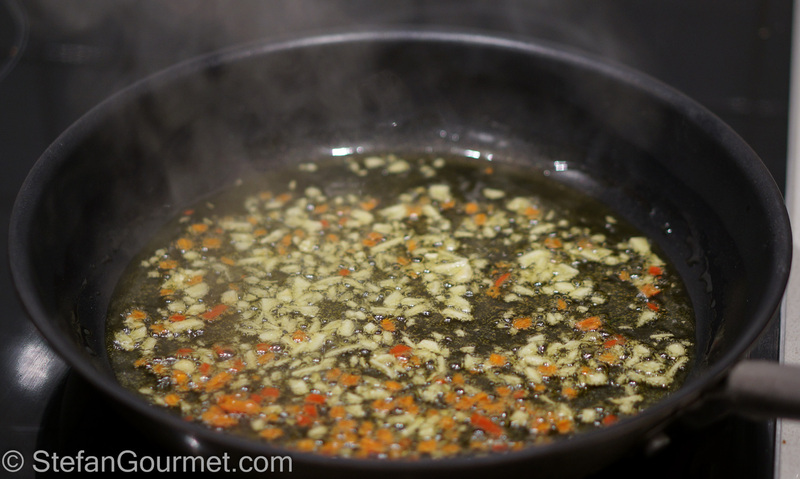 Add the garlic and chili and sauté for a minute. Add the shrimp. Cook them for a minute or so and then turn them over. …and the parsley. Toss to mix, and turn off the heat. 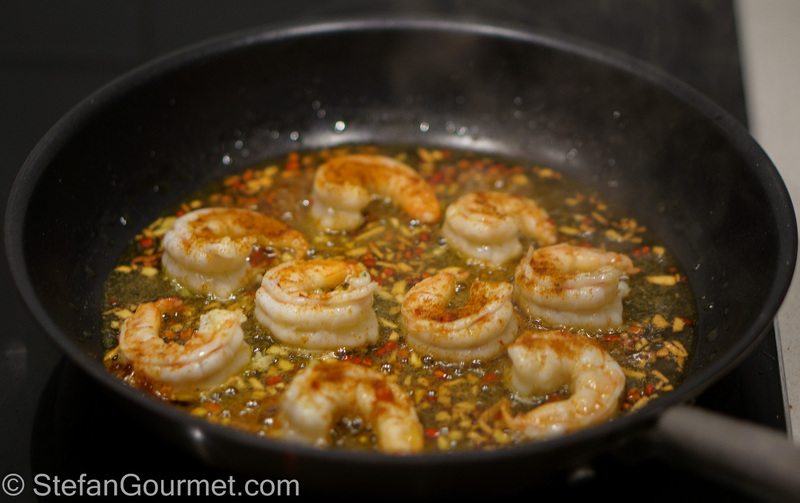 Do this all quickly, as the shrimp will only be tender and juicy if you just barely cook them through. Serve hot in preheated tapas dishes. A Spanish white such as a Rueda would be perfect for this, but I didn’t have any at the moment and opted for a Gavi di Gavi. This turned out to be a blessing in disguise. I would need to confirm by comparing them side by side, but I dare say that the Gavi would be the better match as it works better with the ’roundness’ of the olive oil. 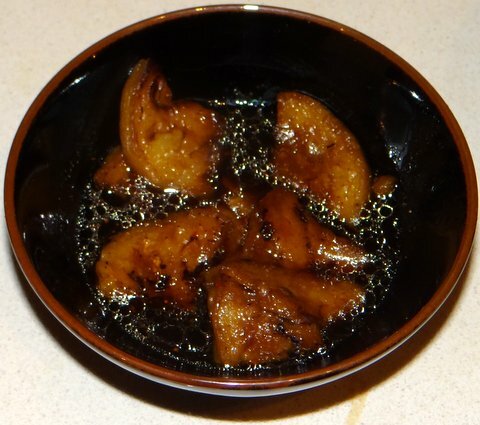 Eggplant simmered in dashi is a great Japanese side dish. Thanks for visiting and taking the time to leave such a nice message. You should try them, it is so easy and tasty. Adoro i gamberoni e voglio provarli come li hai fatto tu. Beautiful and simple. I can’t wait to try this! Gorgeous Stefan and I am sure just as delicious as the picture looks! Lovely (of course). They are delicious. And thanks for the shout-out. Beautiful shrimp! I like the heat factor, too. I love Gambas al Pil Pil. We also brought back the recipe from one of our first stays in the Marbella region. Great recipe!